Author Karen Day signing copies of her debut novel, I'll Stay. Karen Day, a successful author for middle-grade readers (A Million Miles from Boston, No Cream Puffs, and Tall Tales), spent the better part of the last decade writing a novel about close friendships between young women and young women and their mothers. Day's 2018 debut novel for adults, I'll Stay, examines the relationship between Clare and Lee, college friends who on a vacation experience a traumatic event that negatively changes Lee's life forever, while Clare, the daughter of a famous mother, is able to flee to safer grounds. In the novel, the friends went back to school. They didn't talked about the event. The story is narrated by Clare at three different times, 1983, 1986 and 1991. The plot was based very loosely on an incident in Day's own life when she and three college friends went backpacking. They found themselves in a scary situation, surrounded by men, but were able to escape unharmed. They returned to school and never talked about it, either. "It was as if nothing happened," said Day, who ever since wondered why not. "We didn't do it because in those days we didn't do things," Day says now. "We blamed ourselves: We said it was our fault because we flirted with those guys. We questioned our behavior." Enter the #MeToo era, when Day's book, written before it was okay for women to publicly point the finger at men behaving badly, but published after. 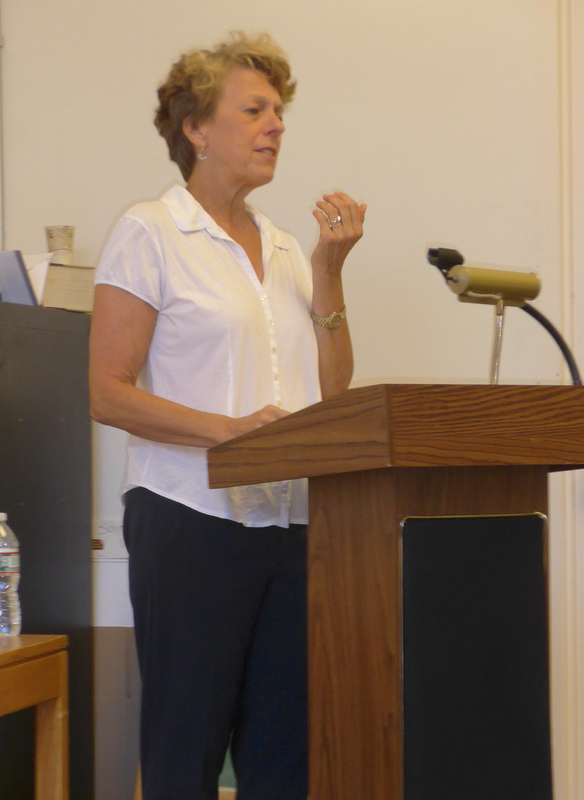 Day, a frank and engaging speaker who appeared unafraid to re-examine the premises of her own work, told the audience at the South End library in June that in writing I'll Stay, she explored where stories come from beyond the words on the page, looking to discover who she and her friends were, and how conflicts between them affected their friendships. She now sees her novel as "a cautionary tale about the impact of split-second choices" and a "testament to how easy it is for girls to stay quiet." Novelist Day describing her search of where stories come from and how they evolve. Day has been writing since she was a child growing up in Indiana, and came East to go school. She was a journalist for newspapers and magazines in the 1990s, and among other articles secured the last interview with tennis champion Arthur Ashe. She has a BA in Journalism, an MA in English Literature and taught undergraduate composition when studying for her doctorate at NYU. With her husband, she raised three children, getting up mornings at 4:30, often with her kids next to her in the beanbag chair, she said. It took her twenty years just to learn how to revise. I'll Stay was the 2017 winner of BUZZ Books; a previous speaker at South End Writes, Jenna Blum, the author of Those Who Save Us, and The Lost Family, called it a “smart, compassionate, psychological spellbinder” with “one of the scariest scenes you’ll read anywhere.” The novel got a starred review from Publisher’s Weekly.